DISCOVER WHY MORE PEOPLE ON THE CENTRAL COAST RELY ON WIDE PLUMBING TO GET IT DONE RIGHT! WHY SHOULD I USE WIDE PLUMBING? When you’re faced with a plumbing problem that has the potential to get out of hand fast, it pays to know someone who has your back in these kinds of situations. 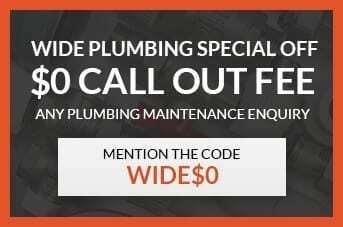 Wide Plumbing Services is a trusted plumbing company that has reliably serviced homes and other establishments in the Central Coast area. Our professionally trained plumbing technicians have the experience and the know-how to handle all types of plumbing situations. From overflowing toilets to burst pipes, we are properly certified and trained to handle all types of plumbing problems. Our customers, as well as insurance companies, know that we’re the name to call on thanks to our stellar reputation and satisfaction rating. Wide Plumbing Services has been serving the Central Coast area since . We pride ourselves as one of the water restoration leaders due to the high level of service quality and customer care that we’ve been providing for many years now. As a fully licensed restoration company, we are dedicated in delivering reliable plumbing services in a fast and efficient manner. If you’re having problems with your plumbing, feel free to give us a call at 0419 012 750 or email centralwideservices@gmail.com for more information about our services. We offer a comprehensive list of plumbing services that covers most common plumbing problems. Here are just a few of the services that we offer to property owners living in the Central Coast area. Regardless of where you live on The Central Coast, our plumbing technicians can easily get to your location and restore your plumbing to its pre-damaged state. As one of the most recognized local plumbing service providers in the Central Coast, our services aim to give our customers the satisfaction of having their plumbing needs met as quickly and as efficiently as possible. To learn more about our services, give us a call at 0419 012 750 or email centralwideservices@gmail.com for more details. The new standard temperature that manufacturers use when pre-setting your hot water heater at the factory is typically 50 degrees centigrade. This is a sufficient temperature for most households. If you have an older model, you can set the thermostat at medium. Gas models usually have a dial on the front of the gas valve. Electric models have thermostats (there may be two) that are concealed behind the two panels on the side of the tank. You can adjust the temperature to meet your needs. Keep in mind that hot water also helps in minimizing the growth of bacteria. Consult your Wide Plumbing professional for the recommended temperatures for your particular needs. NOTE: Turn off the electricity to the water heater before performing any personal maintenance. There can be exposed wires behind the panels that may result in extreme shock. Rumbling sounds can be an indication that sediment has built up on the bottom of the water heater. Water can become trapped in this sediment and begin to boil. This means the water heater is not operating efficiently and the sediment isn’t allowing the heat to transfer to the water in the tank. You may try draining a few gallons of water off the bottom of the water heater tank. This is done by attaching a drain hose to the valve at the bottom of the tank. Allow it to drain for about five minutes. Many newer models of water heaters have a new feature that prohibits the buildup of sediment in the tank. If your heater is an older model, it may be cost effective to replace the water heater if the buildup is severe. Contact Wide PLumbing for year-round maintenance of your water heater. WARNING: Hot water is dangerous. Discharge the water into a floor drain, laundry tub or bathtub. Hot water will kill your grass if allowed to run on your lawn and will also crack a toilet bowl if discharged into the toilet. Turn off power to water heater prior to draining. If left undisturbed, roots from shrubs and trees will completely fill a pipe with multiple hair-like root masses at each point of entry. These root masses quickly become clogged with toilet tissue, grease and other debris flowing from your home to the main sewer, resulting in reduced flow, slow running drains and in most cases a complete blockage. Once roots have entered the pipe, they continue to grow and expand, exerting considerable pressure at the crack or joint. This increased pressure often breaks the pipe and may result in total collapse, which requires repair or replacement. Some pipe materials are more susceptible to root intrusion than others. Clay tile pipe is easily penetrated and damaged by tree roots. Concrete pipe and PVC pipe may also allow root intrusion, but to a lesser extent than clay pipe. PVC pipe usually has fewer joints and the tightly fitted joints are less likely to leak as a result of settlement around the pipe. Allow Wide Plumbing to use state-of-the-art inline drain cameras to view and record your drain problems with roots. When considering any new fixture for your home, we recommend that you choose a fixture made by one of the major manufacturers. If cracks or fissures are present in the tank or bowl, this can impede the operation of the fixture. Poor mounting and deteriorating rings and seals can affect the operation as well. It could be that you have lost your “air cushion.” To get it back, turn the water supply off at the main valve. Turn on all the taps around your home. Then turn on the main valve again and shut off each tap. This should take care of the problem. First, try using a plunger. Second, try using a liquid drain opener, but use caution and read the directions. Third, you can remove the trap and remove any debris. Be careful if you have used a liquid drain opener, because there may be some in the trap. Fourth, if the clog is beyond the trap, there are drain augers that extend from about 15 feet to about 50 feet. There are also special enzyme-based drain openers, like the types used at Wide Plumbing, that will help dissolve buildup in pipes in older homes. See what other customers have to say about Wide Plumbing! "I have had the pleasure in working with Wide Plumbing for a while now as Building Manager for several residential strata plans across the Central Coast. Wide Plumbing attend to every job with a professional approach. Their problem solving, repair skills and detailed reports stand out above others making my job as a Building Manager easier. I would strongly recommend contacting Wide Plumbing for any plumbing repairs or upgrades." "Wide Plumbing did a wonderful job sorting out disasters left by a previous plumber. They are reliable, prompt and have always arrived at the time they said they would (extra bonus points for that). They have been a pleasure to have working in our home. I would recommend them to anybody wishing to have their homes plumbing requirements addresses professionally. Thanks again guys." "I called a few days ago to ask a few questions about my water heater and I have to say, your dispatcher Chris answered all my questions and took the time to make sure I was informed. Thanks for taking the time Chris"
"I wholeheartedly recommend Wide Plumbing for your residential plumbing needs. I have used their services on two occasions now. They are prompt, perform excellent work and charge fair prices. They clean up after their work and leave your house in excellent condition. Will use their services again."